If you’re thinking of investing in a polytunnel, then you’re in the right place. 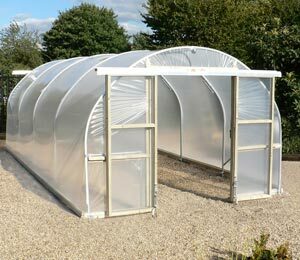 In this guide, we have all the necessary information for those who are completely new to the world of polytunnels. 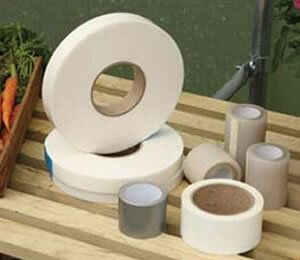 We also have useful care and repair tips for those of you who have been using polytunnels for a while. We’re here to help you in your journey in finding the polytunnel for you. We also have a ton of useful information on how to install and manage your polytunnel when you get it. First things first, what is a polytunnel? 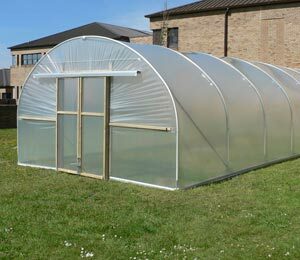 So some of you may be thinking, what exactly is a polytunnel and why would you need one in the first place? 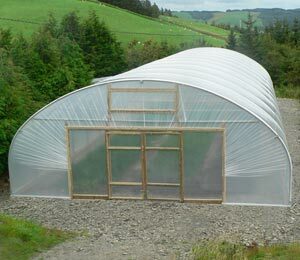 A polytunnel is an elongated, polythene covered frame under which seedlings and plants can be grown. They provide protection to plants and can extend the growing season by several weeks. They come in various shapes and sizes with each polytunnel creating its own microclimate that can enable different types of plants to grow. This means that it’s possible to grow fruits and vegetables using a polytunnel that wouldn’t naturally grow in our climate. 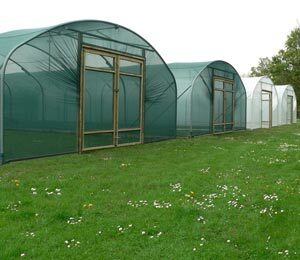 Essentially, polytunnels can be used to protect your crops and plants from the destructive elements of the weather such as strong winds or hailstones. 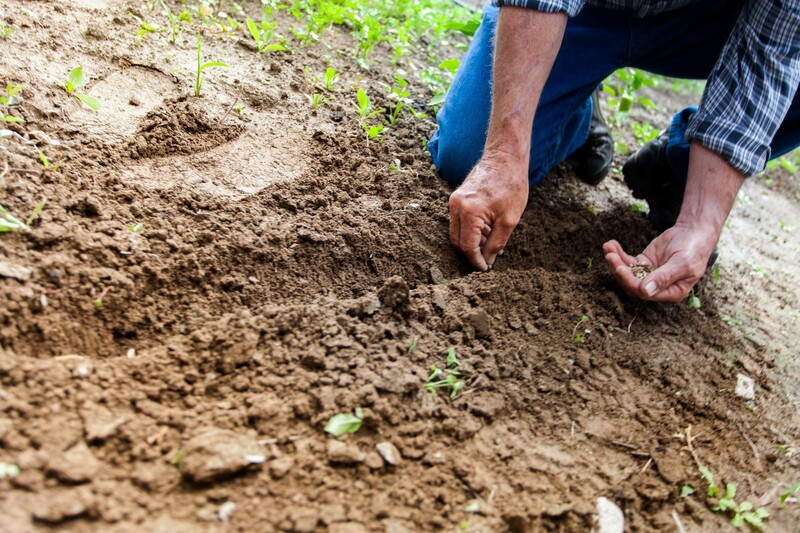 They allow any gardener to grow any type of plants, fruits, and vegetables in any region. They are able to grow that which wouldn’t normally be able to grow in their region’s climate. 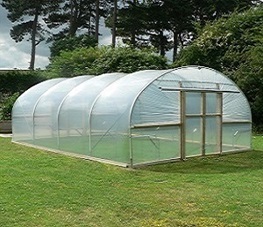 The usage of polytunnels can be compared to glass greenhouses. These are also used for a similar purpose in regions with milder temperatures. But there are various differences between the two which we’ll touch upon in more detail later in the guide. A polytunnel is not only known by that name, so you may have heard of it in the past being referred to as something else. It is also sometimes called a polyhouse, hoop greenhouse, high tunnel or hoophouse. How do Polytunnels actually work? The materials that are used to build polytunnels result in the interior of the tunnel heating up from solar rays. The hot air and humidity are contained in the building by the structure and the polythene covers, so it creates a microclimate for the plants to grow. You can control the temperature and humidity levels of a polytunnel by using either the equipment inside it or by manually adjusting the vents. In the larger and more advanced polytunnels, there is enough space to allow harvesting machines inside to automate production. This is commonly the practice in commercial polytunnels. It has been done to cultivate production of soft fruits in the United Kingdom, such as strawberries, raspberries, and blackberries. What is the price of a polytunnel? The price for polytunnels can differ greatly depending on whether they are domestic or commercial polytunnels. This largely relates to the difference in size required for domestic and commercial purposes. 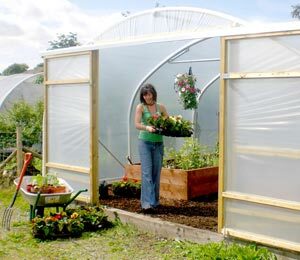 Domestic polytunnels are what people growing plants or fruits in their home use in an effort to extend their gardening period over the colder months. Purchasing a domestic polytunnel means that you can protect your fruits, flowers, and vegetables from the British weather as and when needed. 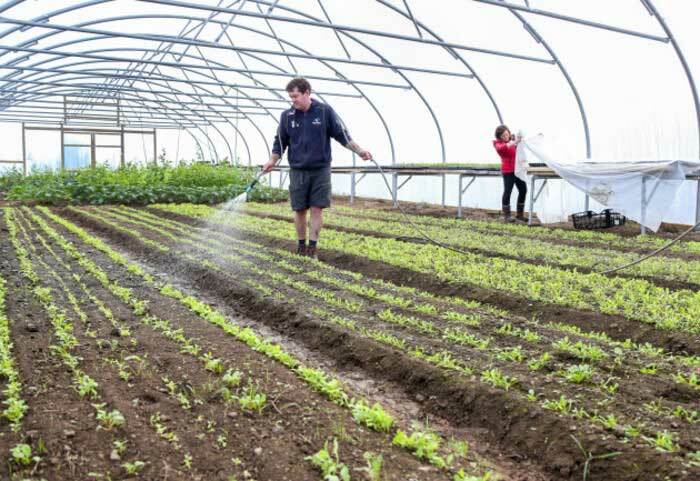 Commercial polytunnels are used by farmers and those who are producing food for commercial purposes, again for protection against the weather and to extend the growing period. 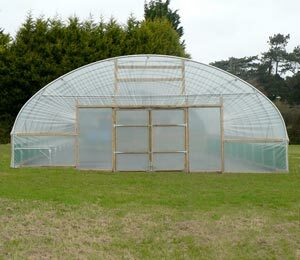 Are cheap Polytunnels any good? So, you might be wondering how much you really need to spend on a polytunnel. Would a cheaper one do the job just as well? We’d recommend that you invest the required money into your polytunnel to get the best value for your money. Ensure that you purchase it from a credible polytunnel manufacturer rather than trying to save money and potentially investing in a substandard structure. It doesn’t necessarily need to be the most expensive option, but the materials used need to be strong and durable enough to offer your plants the necessary protection. If you don’t invest in a high-quality polytunnel, you may find yourself losing more money in the long term if you are unable to protect your crops. This is especially true for when a polytunnel is being used to grow plants, fruits, and vegetables on a larger scale for commercial purposes. When you are planning what you will spend on your polytunnel, you also need to budget for any accessories or spare parts that you may need. The extras can often add up over time so it often makes sense to buy what you know you’ll need upfront. Which is best, polytunnel or greenhouse? The biggest difference between greenhouses and polytunnels is the cost. 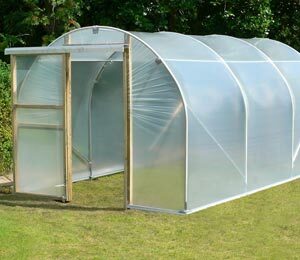 Compared to greenhouses, polytunnel offer really good value. This is especially true if you’re looking for something larger in size, as you get more growth space for your money. The exact same strength of material and ventilation will be provided for a lower price. Also, durability is not an issue as once you’ve erected them they will likely stand for many years. 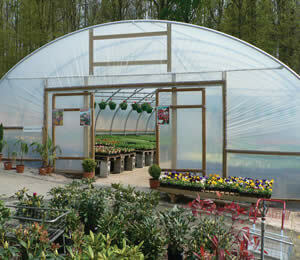 It is easier to customise polytunnels than glass greenhouses. 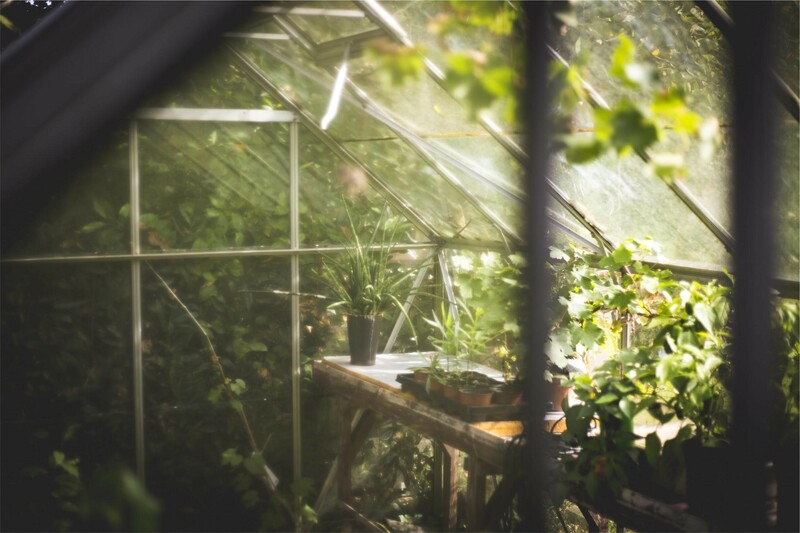 Once greenhouses are fixed, they can be difficult and expensive to modify. Polytunnels can be more difficult to repair, though it is possible. On the other hand, if you break a pane of glass in a greenhouse, it is fairly easy to replace. Preparing a base for a glass greenhouse can take more time, as they require a completely flat base. Polytunnels don’t have the same requirements, so the preparation time before installation is shorter. Polytunnels are not permanent structures and can be transported to different areas or removed as and when needed. Glass greenhouses can’t be moved and would need to be rebuilt in another location if that was required. It all comes down to affordability. If you are looking for a more cost-effective structure to grow your plants that can be easily customised and moved around, then polytunnels are for you. Ultimately, both achieve the same growing benefits for your plants. How should you choose a polytunnel? Consider your own requirements and the space you have available. It is important to ensure that you’re not investing in a polytunnel that wouldn’t be the right fit for your own plot or garden. 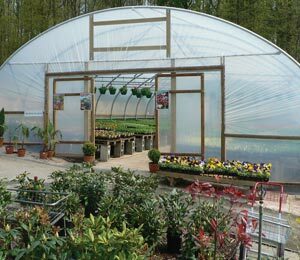 Most polytunnel manufacturers have a wide range of sizes available so you should easily be able to find one that suits your needs. When do you need them by and can you construct them yourself? 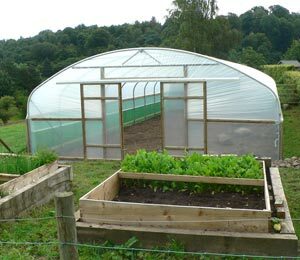 Most polytunnels are simple and quick to construct which is what attracts many people to them. Ensure that yours will be delivered on time and with detailed instructions by placing an order at First Tunnels. Are the materials durable and high quality? 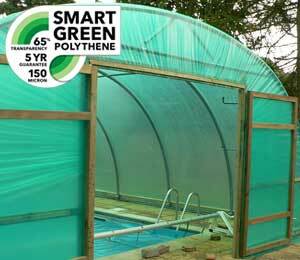 You want a guarantee on the lifespan of the polythene covers of your polytunnel. This will help ensure that you’re not having to invest in regular replacements. At First Tunnels, we offer a 5 year guarantee for our polythene covers. 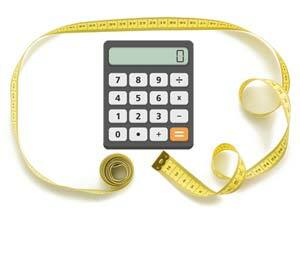 Planning before you purchase is important to make the right assumption on what size you will need. You need to make a plan of what you will grow and where to make sure that you’re buying a polytunnel that will have enough space for your needs. It is also important to mention here that you should look into whether you may need planning permission before you install a polytunnel. You don’t usually need this, but you may if your site is near a listed building or area of conservation. How should a polytunnel be cleaned? In the winter months, you may find that the dampness in the air has led to your polytunnel cover becoming coated with green algae. It’s extremely important that you get this cleaned immediately, as it will obstruct the light and hinder the growth of your crops. Even if you see the algae on just one side, it is recommended that you clean everywhere regularly to ensure you’re getting the optimum level of light in your polytunnel. Find a form of sheeting (such as a fabric), two lengths of rope, and a cleaning fluid. Pick a cleaning fluid that is made to remove algae. You’ll also need two tennis balls, a sponge, a hose, a bucket of soapy water, and a bottle that you can spray the cleaning fluid with. Once you’ve got all the equipment together, insert the tennis ball on both ends of the sheet and tie it up with the rope. This makes the sheet weighted for you to use for cleaning. The weighted sheet then needs to be dipped into the soapy water in the bucket. Start off by cleaning the top. Using the hose, spray water all over the top of your polytunnel. When you’ve managed to wet this, toss your weighted sheet over it. Ask your helpful friend to go to the other side of the tunnel and take hold of the weighted sheet from the other side. Then both of you need to start pulling the sheet from side to side, which will work in rubbing off the algae and any other dirt from the top of the tunnel. Work your way down each section and repeat as often as needed. Once you’re satisfied, spray water all over again using the hose. This will help ensure that any leftover dirt or debris is sprayed away. For the sides, the cleaning process is similar to washing a car. Wet your sponge and spray the cleaning fluid onto it. Using this sponge (or a soft brush if you prefer) proceed to wipe the sides of the polytunnel clean. Any leftover dirt should be rinsed off using the hose. To deal with any algae and dirt on the inside of the tunnel, use a sponge again. Spray the cleaning fluid onto it again and work your way around the interior of your polytunnel. It is also recommended that you use a non-toxic cleaning product to ensure that your plants don’t suffer from any toxins. If you follow these cleaning steps as and when you see any algae build up, you’ll be allowing in the maximum level of sunlight and giving your plants what they need to grow. How can you secure a polytunnel? Your polytunnel needs to be firmly secured to the ground, especially if you’re setting it up on a slope. To ensure that you’re going to be able to secure it effectively, purchase your polytunnel from a reputable manufacturer that provides detailed instructions and after-sales care if needed. 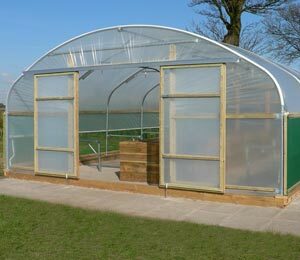 Many polytunnel manufacturers even offer a construction service if you need it. 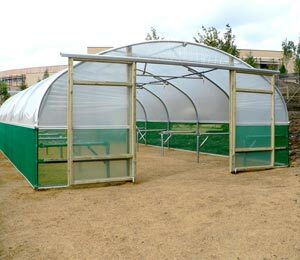 It is not difficult to construct a polytunnel, but it’s also not a task that you should take lightly. You need to secure your structure so that it will endure any weather conditions and last the test of time. Some people may compare it to putting up a tent, but it definitely needs to be more firmly secured than that. In terms of how long it will take, this can vary depending upon specific factors such as the weather conditions and the size and features of your polytunnels. It also depends on how good you are at doing DIY projects! We’d recommend enlisting the help of a friend to get it completed quicker. Polytunnels are generally very sturdy and durable, but like any product, they are prone to damage and will sometimes need repair. We have all the information you need on what to do in case of any damage, and how to help prevent this in the first place. Firstly, you need to ensure that you’re getting the right cover for your polytunnel in terms of thickness. 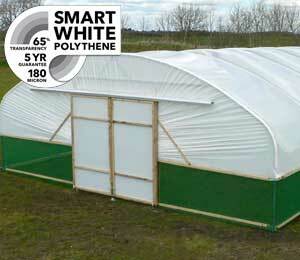 The cover for your polytunnel should be a minimum of 720 gauge (about 180 microns). This is the level of thickness which is guaranteed to last about five years. It can even last up to ten years in some cases. As with most products that are used outdoors, you need to monitor it closely and regularly to keep a close eye on any potential issues. The area that is most likely to suffer damage is the polythene cover so this should be checked on a regular basis. Any small tears or damage that you spot need to be dealt with as soon as possible to prevent the issue worsening. If you spot a tear, then you should repair this immediately using polythene repair tape. The reason to use this instead of regular tape is that it is transparent and UV stabilised. It will avoid the obstruction of sunlight without being damaged by the sun rays itself. Consider taping both sides of the tear to result in a sturdy and strong finish. 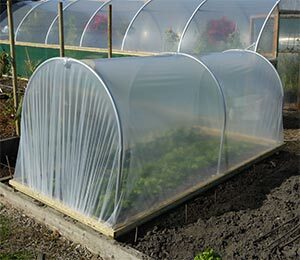 Other than the polythene covers, make sure you check regularly for any damage in the frames or the hoops of the polytunnels. Deal with any damage as and when you spot it as soon as possible. Remember, if you leave it too long before you mend it, there is a danger that the damage could grow. Also, try and deal with the cause of the damage so it doesn’t happen again. To prevent damage along the hoops, anti hot-spot tape should be used when constructing the polytunnel. This works to effectively separate the hoop from the polythene cover and prevent heat degradation. With frequent inspections and quick repairs, your polytunnel will last you years. Just make sure you give it the care that it needs! Hopefully, this guide has helped answer many questions about polytunnels, their benefits, and the essentials of caring for one. If you’re considering purchasing a polytunnel. For over 20 years we’ve been leading the way…whether it’s product innovation, great prices, fantastic service, or by getting the country’s top gardening and food experts to help us develop the polytunnels they chose to use themselves…people like Alan Titchmarsh, Hugh Fearnley-Whittingstall, Bob Flowerdew, Mark Gatter, Andy McKee and Paul Peacock. 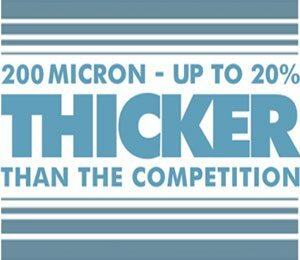 Our customers must think we’re getting it right too… because we now sell over 3000 tunnels per year! The best cover for the growing conditions is vital. So is knowing it can stand up to the worst the British weather can throw at it. 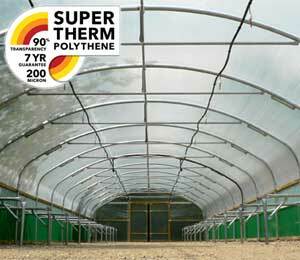 Polythene’s biggest threat is sunlight that’s why First Tunnels uses 800-gauge polythene sourced from experts in Southern Spain. It’s tough. It’s strong. It’s been specially developed to cope with extremes of UV. And we’re so sure it’s up to the task, we guarantee it for a full 5 years! Though it’s not uncommon for our covers to last closer to 10 years. All you have to do is decide which is the best cover option for you…with a little help and advice from the experts. Specifying the right timber is important. If it’s too light, strength and rigidity are compromised. Too heavy and items like doors start to become unwieldy and difficult to move. 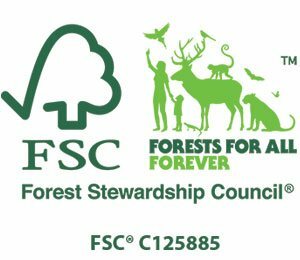 Naturally we’re also conscious of the environment and the impact of using natural materials, that why all our wood is fully FSC accredited. We’ve spent a long time arriving at the ideal timber thickness for doors, door frames and base rails And every inch of it is treated with TANALITH E to help preserve its strength, shape and rigidity. No shortcuts. Just the best materials for the job, carefully selected to perform perfectly. So what’s it to be…single doors, wide doors or double doors, doors that open in, doors that open out? How about our brand new sliding door? 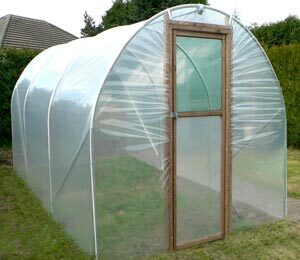 The size of your poly tunnel usually dictates whether you have single or double width doors. But the other choices are entirely up to you…with as much help and advice from us as you need on saving space, ventilation, locking and all the other practical considerations. Check out the above video showing how strong our Polytunnels are and how well they cope with extreme weather conditions in Sweden. Of course, some poly tunnels are sited in particularly exposed and windy places. So, where your poly tunnel may be subjected to extreme conditions, you can upgrade to a higher spec of hoop. 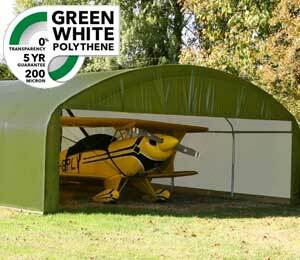 For example, 10-12ft polytunnels can be upgraded to 35mm hoops, and 14ft polytunnels can be upgraded to 50mm hoops. If you are in any way unsure of the best size of hoop for your particular conditions, don’t hesitate to get in touch with us. We’ll help you make the right choice and even offer you a bespoke solution when an unusually high level of strength and rigidity is called for. Despite appearances, a First Tunnels' polytunnel is actually very easy to construct. But as with everything, there's a right way and a wrong way. So we do everything we can to make sure you do it the right way...with the minimum amount of fuss and effort. We've got numerous videos including an easy to follow step-by-step demonstration of how to build your polytunnel, clean and maintain a polythene cover and advice from gardening experts to ensure that you get the most from your polytunnel. 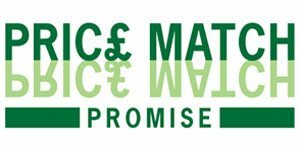 You can view the demonstrations on this site via your computer, laptop or even mobile phone to find the answers to all the usual questions. Plus pick up lots of extra tips and ideas by following us on Facebook, Twitter, YouTube and the blog. We also have a dedicated team of constructors who can install your poly tunnel perfectly. If all else fails...just give us a call on 01282 601253. We know many people build their polytunnels at the weekend or over a bank holiday when our office is closed. So we've set up the First Tunnels Construction Helpline specifically for these weekend periods. This allows you to talk directly to a constructor, ask their expert opinion, get the answers and complete your polytunnel. If you'd like us to ring you, simply send us a text and we'll ring you back. Please note this service is NOT available over the Christmas period and Bank Holidays. We've already mentioned our videos. But this isn't simply a collection of 'home movies' showing you the 'whys and wherefores' of construction. We brought in a professional production crew and filmed the whole process of building a polytunnel...from initial site preparation, right through to the finishing touches. And then we added loads of 'extras' too...everything from tips on ordering to expert advice from some of the professional gardeners who already use our tunnels. We believe in quality - quality instructions for a quality product. So you'll find our printed manuals are equally comprehensive and easy to follow...and they're an invaluable guide and reference when you're in the thick of things 'on-site'. First Tunnels website includes all kinds of information designed to make ordering easy…from helping you decide which polytunnel is ideal for you, to choosing the cover, 2 or 4 pieced hoops, the doors, the anchoring…in fact, everything you'll need to deliver the perfect polytunnel gardening experience. Our special intuitive calculator which helps you choose the perfect configuration and the extras you'll need. And once you've decided, the whole ordering process is quick and simple. Of course, you can ring us too on 01282 601253 and we'll help you through the whole process. Because every single polytunnel we make is ‘made to order’, we can’t pull a finished product straight off the shelf. Instead, we have to hand-select each of the component items, making sure we’ve included all the extras you may have decided on. The good news is we keep absolutely everything in stock, which means we can usually turn your order around very quickly. In the unusual event that something is out of stock, we’ll let you know immediately if there is likely to be a delay. Otherwise, you can expect despatch of a domestic polytunnel in only 5 working days…even quicker if you order during our ‘quieter’ period which is usually from September to December. We believe we make the best polytunnels you can buy. But don’t just take our word for it. 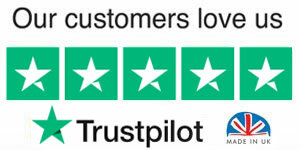 We sell polytunnels to NHS Trusts, schools, major government organisations and loads of household name ‘celebs’ in the gardening and food business, people like...Alan Titchmarsh, Bob Flowerdew and River Cottage chef Hugh Fearnley-Wittingstall. We also work closely with the leading experts in polytunnel gardening…Mark Gatter, Andy McKee and Paul Peacock. To find out what they think of First Tunnels...check out our website, Facebook, Twitter and the blog. But don't just take the celebrities word for it. What better way to learn about company dependability, product quality and customer service than to hear it straight from other consumers?